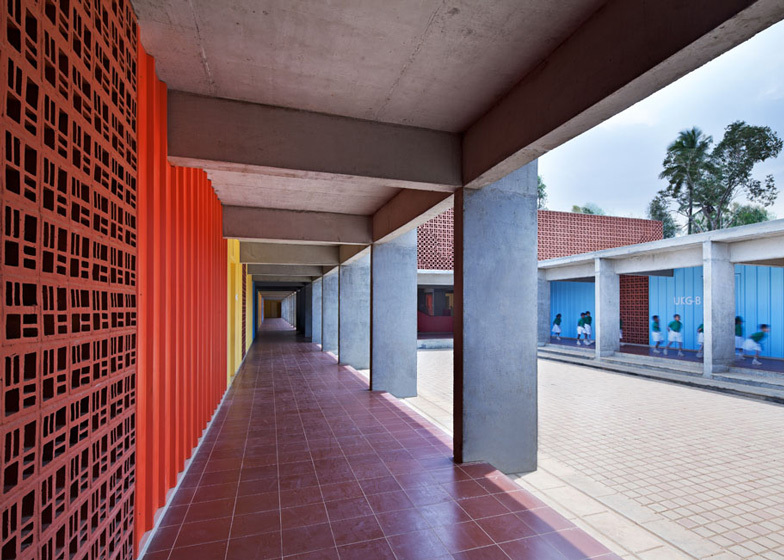 Indian studio Khosla Associates used a modular concrete framework, bold colours and perforated terracotta screens to create this climate-sensitive kindergarten in Bangalore, which topped the education category at the Inside Festival awards earlier this month. 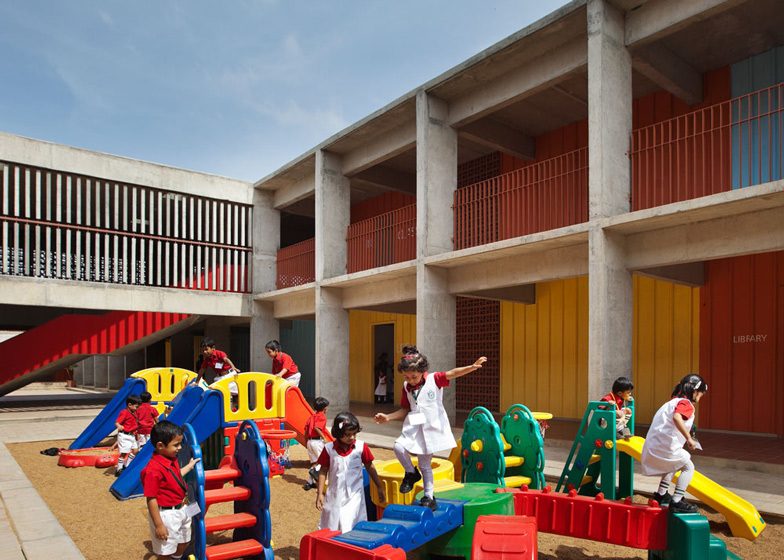 Khosla Associates designed the Delhi Public School kindergarten as a prototype for a series of school buildings that will be rolled out around southern India in the future. 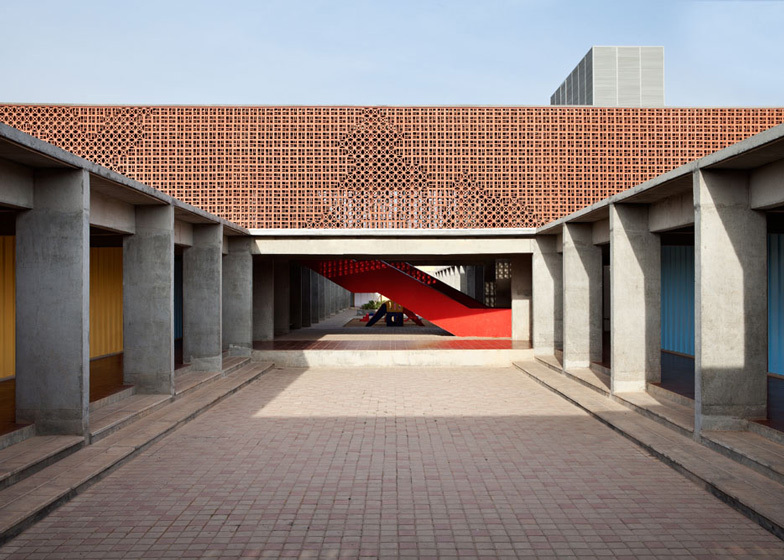 "We were asked to create a simple and cost-effective language that could be adapted easily to different site conditions and slightly varying programs," explained architects Sandeep Khosla and Amaresh Anand. 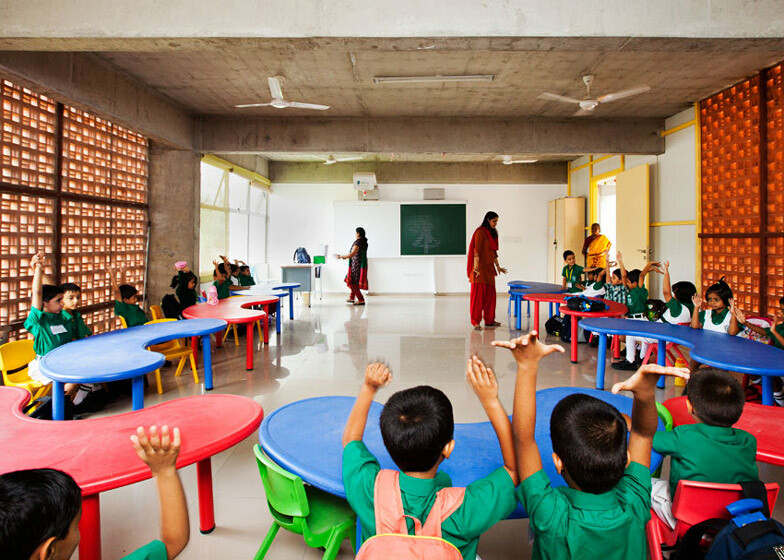 A modular concrete framework provides a standard size for the classrooms, which in some places are stacked to create a second storey. 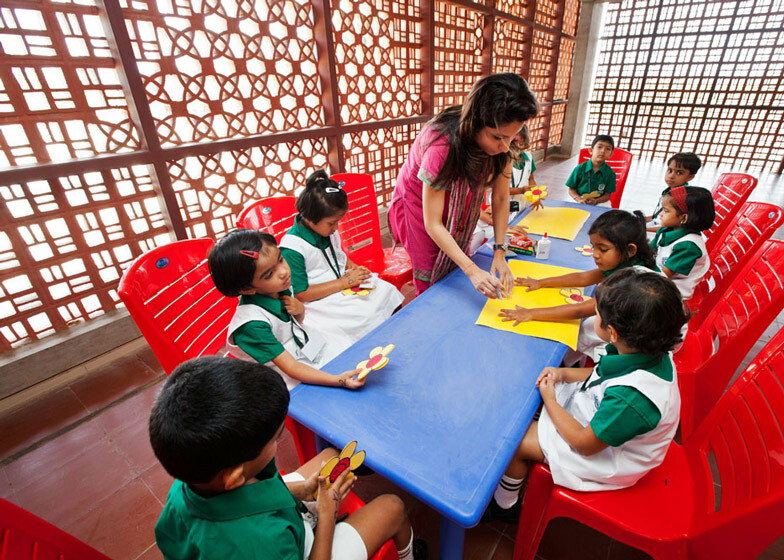 There are 25 classrooms in total and they are arranged around a pair of courtyards that can be used as either playgrounds or outdoor learning spaces. "The central linear open-to-sky court is the soul of the school and facilitates learning outside the classroom," said the architects. 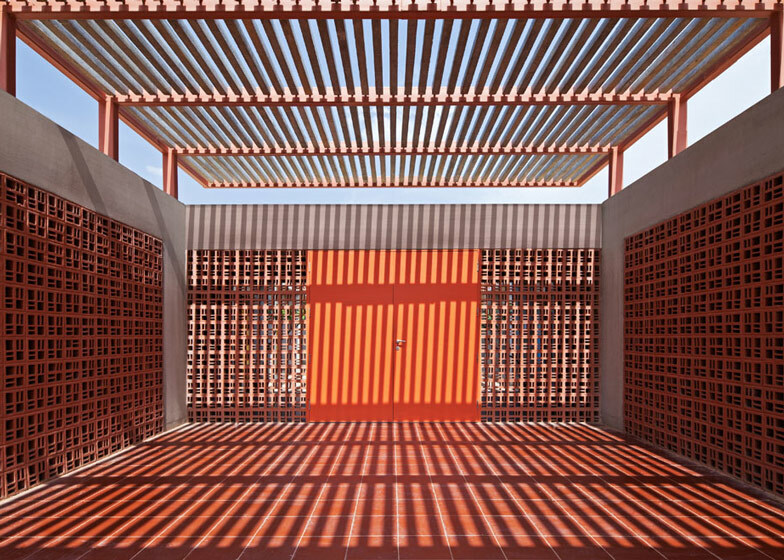 Rather than adding air-conditioning systems, Khosla and Anand wanted to make use of natural light and ventilation throughout the building, so they installed a series of perforated screens. Constructed from two standard types of perforated brick, these decorative screens - referred to locally as jaalis - reduce the impact of direct sunlight and enable cross ventilation. 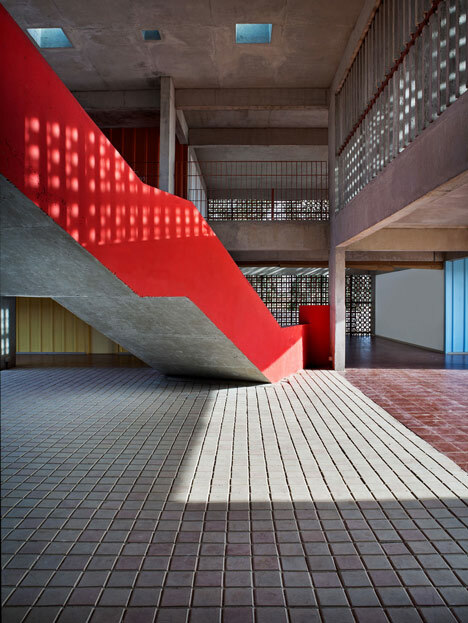 In places where more solid walls were needed, the architects added corrugated metal sheets in vivid shades, intended to reference the colours of traditional Indian textiles. "The simplicity of the repetitive exposed concrete structure is what eventually dictated the design outcome as we added flexible layers onto it," they explained. 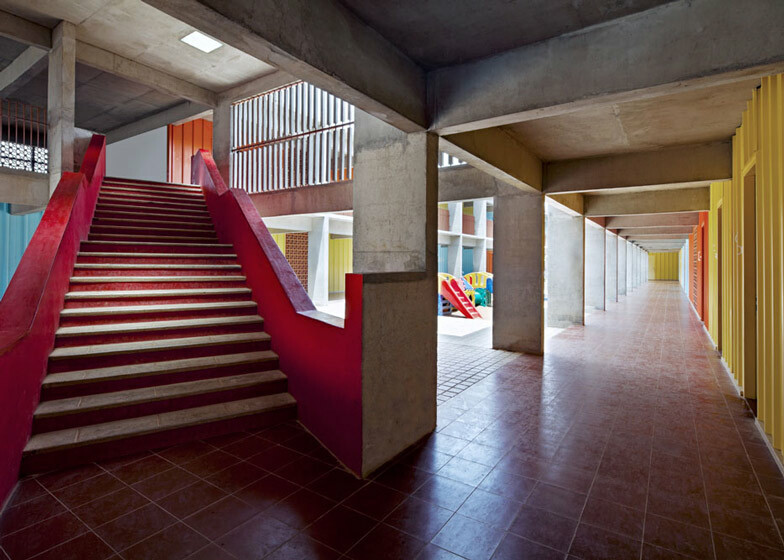 Corridors run around the central perimeter of the school, while a bright red staircase connects the ground floor with classrooms on the upper level. The kindergarten is the first of four blocks proposed for this site and will be followed by construction of junior, middle and senior school buildings. Photography is by Shamanth Patil J. The brief called for us to design a franchise for a popular north Indian school chain called Delhi Public School. Since the model was to be potentially replicated across several schools in South India, we were asked to create a simple and cost effective language that could be adapted easily to different site conditions and slightly varying programs. While the overall master plan currently under construction comprises a kindergarten, junior, middle and senior school block that will eventually cater to 4000 children; the current kindergarten facility has 25 classrooms, and with 40 children a class, a total strength of 1000. 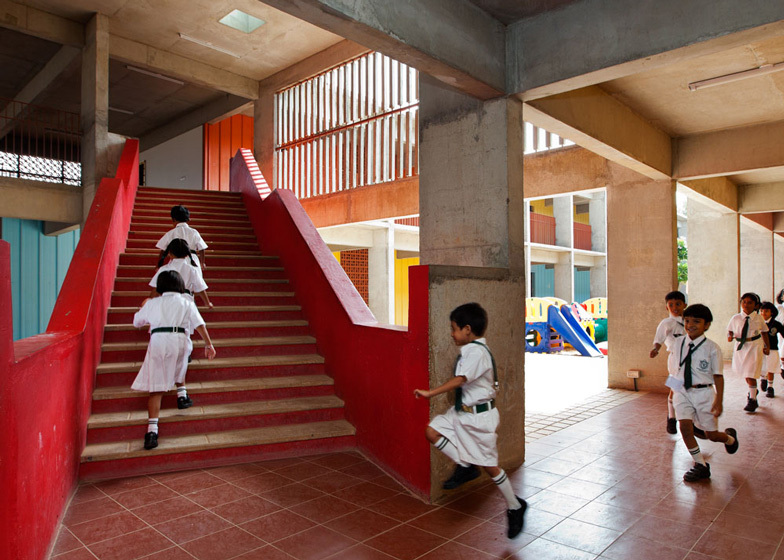 The classrooms on either side flank an 8ft wide single loaded corridor and open up to a central open-to-sky courtyard. The simplicity of the repetitive exposed concrete structure is what eventually dictated the design outcome as we added flexible layers onto it. We added a corrugated metal wall on all corridors, which would serve a dual purpose; facilitate speed of construction and be durable for the wear and tear school corridors usually take. The corrugated sheets also gave us the opportunity to play with pattern and use tropical colours typical of the vernacular architecture of the region. 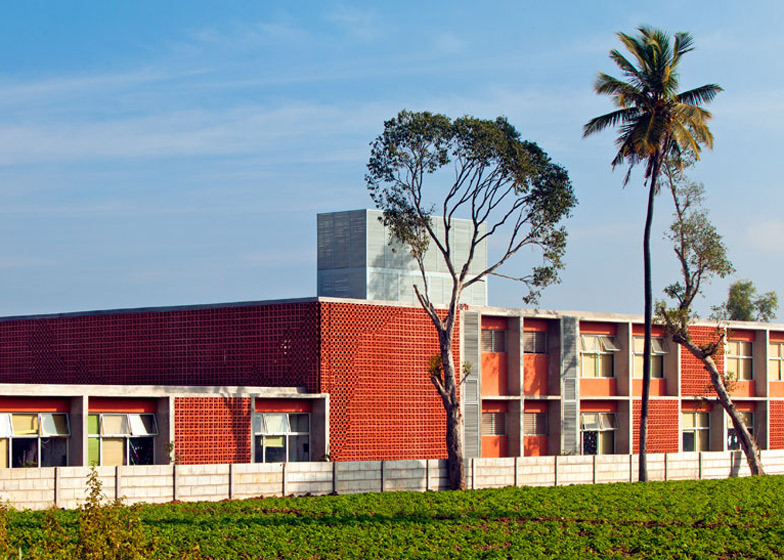 Other contextual references are in the vernacular terracotta jaalis (shading and ventilation screens used traditionally in India) that wrap around parts of the building and are included on both sides of each classroom to facilitate adequate cross ventilation from NE to SW. The jaalis cut down the sun especially on the western face of the building where we have effectively used them in breakout areas. Judging the sun directions we played with a number of devices: horizontal and vertical pergolas and a combination of two different patterns of jaali on the exterior that create interesting patterns on the building at different times of the day. The central linear open-to–sky court that runs the entire length of the building is the soul of the school and facilitates learning outside the classroom. The temperate climate of Bangalore allows for open to sky discussion on benches surrounding the courtyard trees or on the steps of the corridors. In an age of air-conditioned schools becoming increasingly popular, we have attempted an energy efficient and cost-effective approach that utilises minimal electrical load during the day due to effective harnessing of breezes and adequate natural light during the day. It is our hope as architects that we are able to take this simple yet effective typology further to other franchises in the region. Contractors: Gomini Constructions Pvt. Ltd.
Project Management: Kris Cooper Pvt. Ltd.
Landscape: Garden World Pvt. Ltd.